One-Way Manufacturing is Nadcap accredited in fusion welding per AWS D17.1. We perform Aerospace welding on many types of assemblies for a variety of customers including Pratt Whitney, General Electric, Airbus, etc. We can perform welding as an additional process for our assembly parts or stand alone for our customers. We possess extensive tooling used in welding and a variety of turntables of differing sizes. We can weld MIG, GTAW (TIG), and Orbital weld. We have the capability to weld thicknesses ranging from .013″ and up. 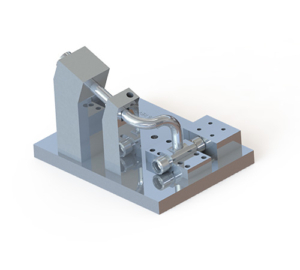 Our scope of work includes tubing, sheet metal, brackets, fittings, manifolds, etc. We are able to complete simple and complex welded assemblies by manufacturing and tailoring specialized fixtures and tooling for each component first with computer aided design and then having them built in-house by our machine shop. Our fixture design and fabrication turnaround time is extremely quick to reduce leadtimes. We’re certified in many different types of metals ranging from Aluminum to Stainless to a variety of exotic materials. Contact us for a quote for your welding requirements!